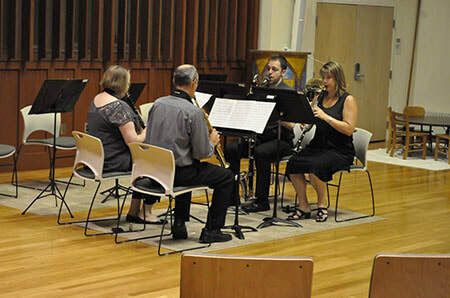 ​Tuesday, August 14, 7:30 p.m. The rest of the introduction is unambiguously a simple B-major chord progression. Following the B-major introduction, a few short rhythmic-melodic themes are presented. A counter proposal in B-flat is made, featuring a melodic interval of the minor sixth, but the exposition ends in B-major. ​The development passes through a number of keys and returns to B, only to be thwarted by an abrupt shift to an F-centered tonality. The shift in key is accompanied by a shift to a compound meter, adding a further diversion. This F area is the dominant of B-flat, and after a quasi-false recapitulation, the original themes do return but with strong harmonic characteristics of B-flat and E-flat simultaneously. As if sensing the trouble, the horn calls out prominent F-sharp to B-natural figures amid the frenzy, ultimately leading to a full break and grand pause, after which all instruments return to the tranquil B-natural center and thematic materials of the introduction, bringing the work to its conclusion. ​Other harmonic/melodic properties used throughout the piece include numerous minor seconds, which reinforce the B vs. B-flat feeling, and a fair amount of tritones, which plays to the F-B relationship. 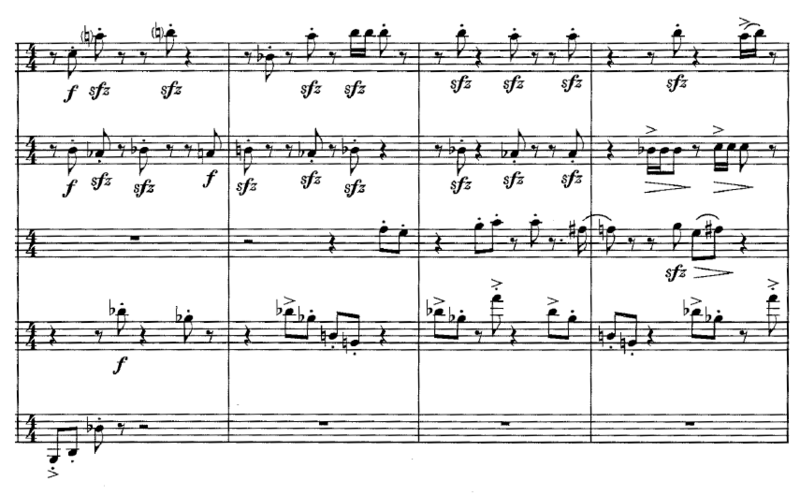 As remarked by the composer in his preface to the score, the piece has characteristics of the Baroque-era fortspinnung (spinning forth) compositional technique, whereby motion is imbued through the constant repetition and development of small figures. 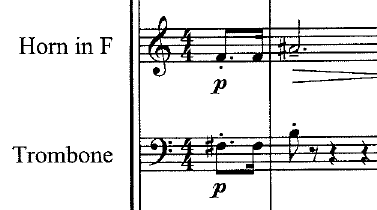 The general forward motion of the piece is interrupted only twice: once by the grand pause near the end, which serves as a general reset before the re-establishment of B-major for the conclusion; and earlier in the piece at the end of the development section. There, the texture breaks down into a stuttering, pointillistic interchange of isolated notes among all five voices, as though the instruments are now confused about their position and momentum, unsure if B-natural is the right place to be (is B-flat the tonic, or is B-flat really A-sharp in disguise and the leading tone to B? ), and are saved only by the abrupt F-major retransition that restores their direction, but not yet the right key. 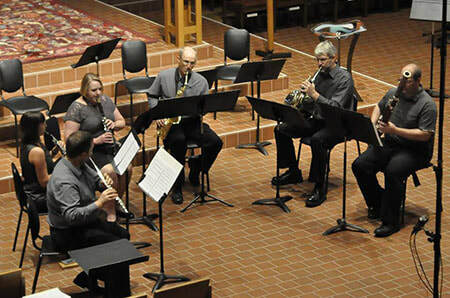 Analysis and description by Jeffrey A. Ohlmann, Neoteric Chamber Winds, 2018.